Food has been a universal connection between people for a really long time now. The fact that even though the ingredients are the same but the end product turns out to be different every time, is a sign of the diversity that the world has to offer. In fact, we don't even have to go that far. There's enough diversity in our country to begin with and Assam has to offer just right kind of flavours to tickle your taste buds. With a wide variety of indigenous food to offer, the food of Assam is famous for its distinct flavoring and influences. Did I mention that it is a heaven for non-vegetarian lovers? Delicious pork, chicken and mutton dishes will leave you craving for more. That's not even all! The herbs and delicate flavors, along with the influence from Bengali cuisine, make the food of Assam a joyous affair for all food lovers! This dish of Assamese cuisine is one of a kind. It is a delicious curry made from raw papaya, pulses, taro and also with a main non-vegetarian ingredient. All of these is then filtered through dried banana leaves which gives it a unique and an unexpectedly refreshing flavour. It is generally eaten with rice during lunch. 2. Duck meat curry ?- Assamese food delicacy! Duck meat, if cooked properly, tastes heavenly. This delicacy of the food of Assam is cooked with Ash Gourd (lauki) and is generally cooked on special occasions. The use of whole spices gives it a unique flavour. 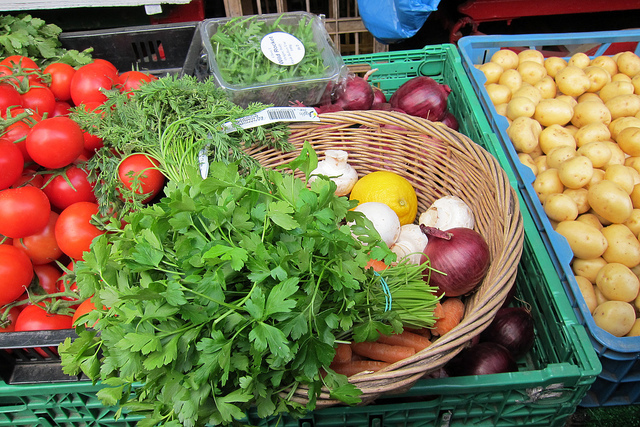 The curry can be cooked according to individual preferences which varies from person to person. 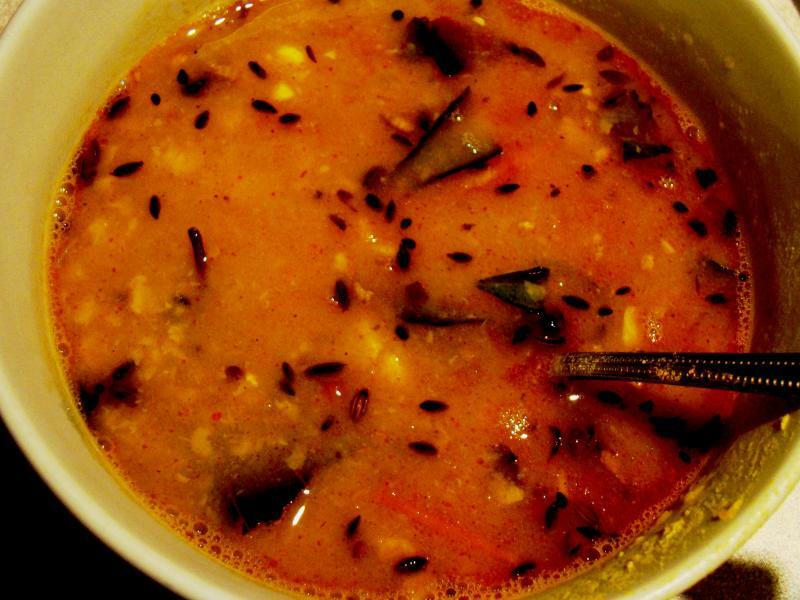 It can be cooked in lentil, sesame, pumpkin and a lot more! This graceful dish of Assamese cuisine is extremely refreshing on the palette. The fish curry is made with everything sour and yet it magically turns out to be delicious! The fish is slow cooked in a rich,tangy broth made with tomato, outenga(elephant ear), and lemon. The end result is a melt-in-the mouth fish, flavoured in pure awesomeness. Ask any Assamese person about this dish and watch them drown in home-sickness just at the mention of it. 4. Aloo Pitika – Comfort food of Assam! Aloo Pitika is a simple side dish accompanied to rice and dal. A soul food in its truest sense, aloo pitika is loved by all of Assam. It is essentially mashed potatoes with mustard oil, onion, coriander and salt. This dish can be eaten at both lunch and dinner. Assam version of the humble mashed potato is delightfully simple and flavoursome. So this dish is a usual side dish for lunch/dinner. Made with herbs and vegetables, the components of this dish are generally seasoned with ginger, garlic, cinnamon, onions and sometime lemon. It is a staple form of food of Assam which is consumed on a regular basis, and is still tasty and flavorsome! 6. Ou Khatta – Food of Assam to tingle your taste buds! Ou khatta is a delicious sweet and sour chutney made out of ou(elephant apple) and jaggery. The ou is first boiled and then mashed lightly. Then it is sautéed with mustard seeds in slight oil and then the jaggery is added. The dish then ready as a great compliment to your meal. As cruel as it might sound, pigeon meat is a delicacy in Assam. It is simply a delight for non-vegetarian. Pigeon meat usually makes your body warm and is perfect to eat in winters. 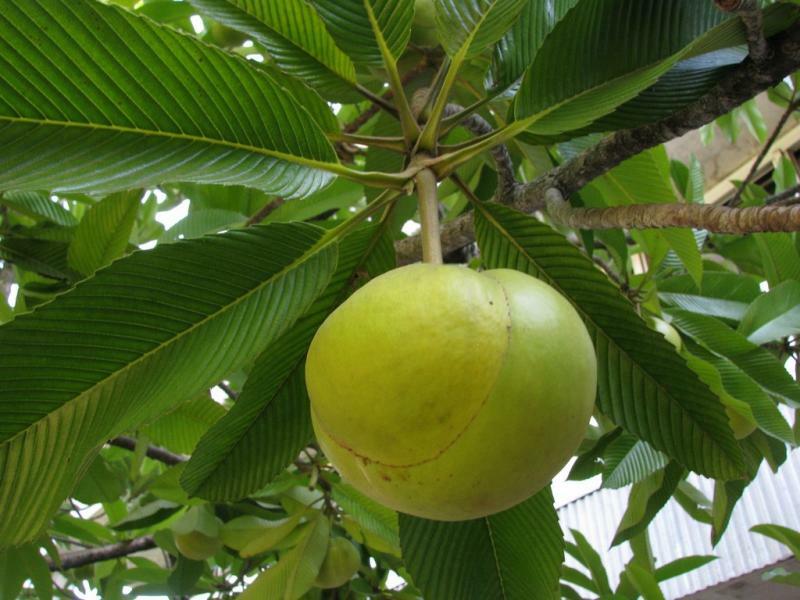 It tastes best when eaten with koldil (banana flower) which is a common side dish in the food of Assam. This is a wonderful Assamese dish which combines the deliciously texture of the banana flower with Pigeon meat. Banana flowers are the buds of the banana plant, which are soaked and shredded for use in curries. 8. Silkworm – Creative food of Assam to stoke your imagination! Yes, Assamese people like to eat creepy crawlies too and make it taste awesome! I think the word ‘exotic’ would best describe this dish. 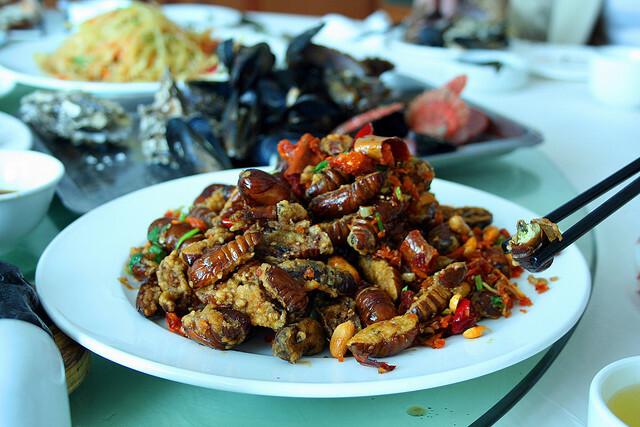 Essentially a tribal dish, the larva is stir fried with spices. It is crunchy on the outside and liquid-like on the inside. Might not please everybody, but is definitely worth a try! 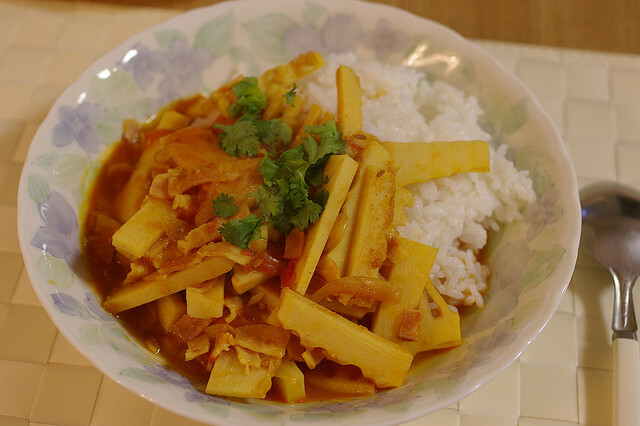 This is a unique dish of the food of Assam made with chicken meat, bamboo shoots and lentils. The taste of bamboo shoots is not very common and doesn’t suit everyone but once you eat it, it leaves behind a unique taste which is generally complimentary to meat dishes. 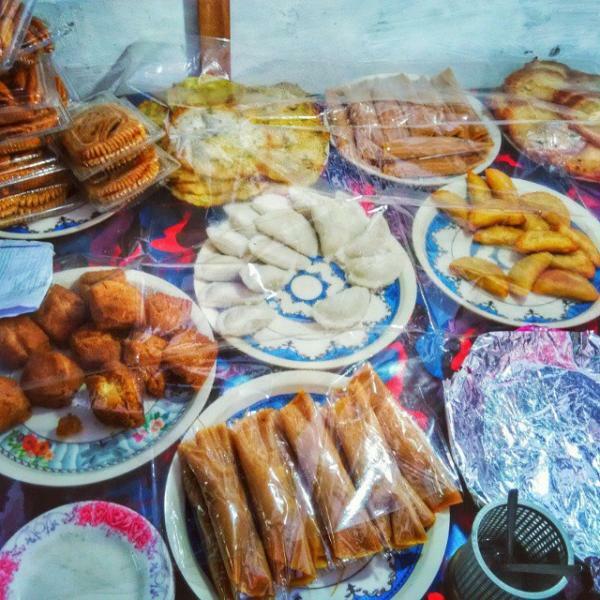 Pitha is one of the most popular snack time dishes, usually eaten at breakfast or with evening tea. There is a wide variety of pithas available. They can be sweet or savoury, steamed or fried, cooked in a many different techniques. This is one of the most technical foods of Assam and needs a lot of precision to get the dish to turn out correct. 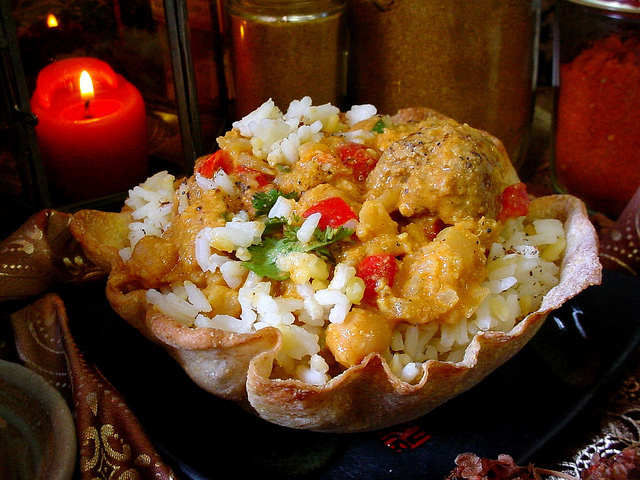 P.S – The Food of Assam has a lot of influence in terms of food from the state of Bengal. The porous culture sometimes makes it difficult to ascertain what foods are exclusive to either of the states.